Should I give my child Melatonin? Thanks to Maty’s for being my partner for this post, to share such an important message. About two years ago, our son received the diagnosis of Central Sleep Apnea. Central sleep apnea is a disorder in which your breathing repeatedly stops and starts during sleep. Unlike normal sleep apnea, caused by a blockage, Central sleep apnea occurs because your brain doesn’t send proper signals to the muscles that control their breathing. It’s very rare, and it scares me to think that he has to deal with this. His neurologist said that it is like his mind thinks he is drowning when he goes to sleep, so it wakes him up. We found out through a sleep study, performed by his neurologist and he now wears a CPAP machine to combat the apnea. The CPAP machine pushes oxygen into his body, through a mask, while he sleeps. The scary part is that before we found out the cause of his multiple wakeups (more than 8 per hour), we were going to try using Melatonin to help him sleep. It was our doctor’s suggestion before we decided to see a neurologist. If we had used Melatonin, we might never have found the cause of his wakeups, and he could have struggled with breathing/sleeping his entire life. 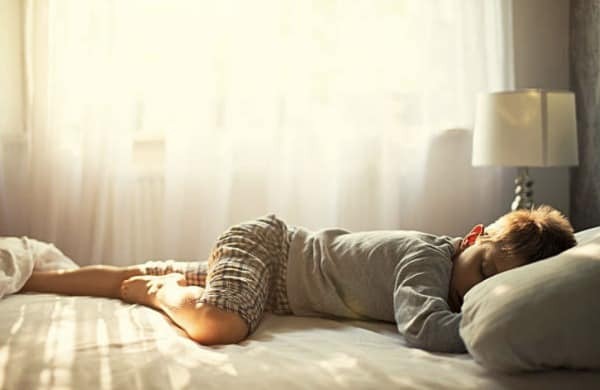 For that reason, I have not tried Melatonin with any of our kids (I am afraid it would mask the real issue), but there are many other reasons that I think we need to be aware of before using it. There are also many alternatives that I’d like to suggest. hile Melatonin is available over-the-counter (OTC) in the US and Canada, Melatonin is accessible only by prescription or even banned from being sold over the counter in other countries. It is natural when produced in the body. This potent hormone produced in the body secreted by the pineal gland in the brain at the onset of darkness initiates the sleep cycle. When listed as an ingredient in products, it’s a human-made synthetic. What can you try instead of Melatonin? – Natural, whole-foods. Chamomile and Nutmeg are great places to start. 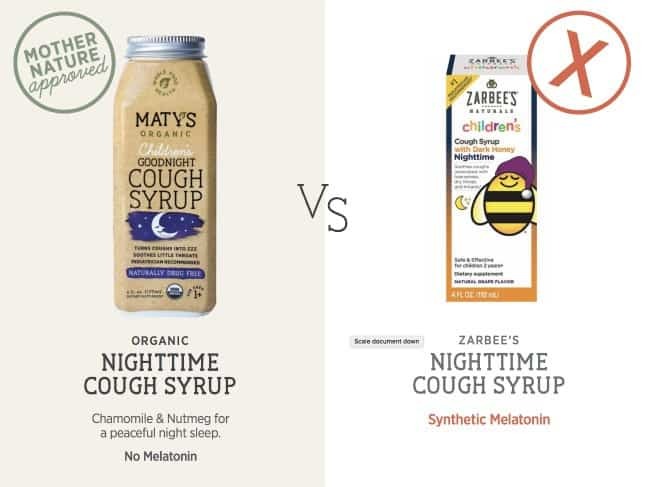 – Use a nighttime cough syrup that is all natural. It soothes the child and promotes peaceful sleep. 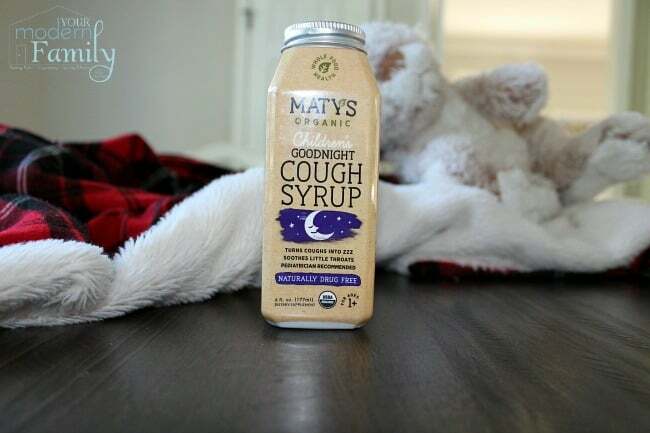 We like Maty’s Organic products for this reason. 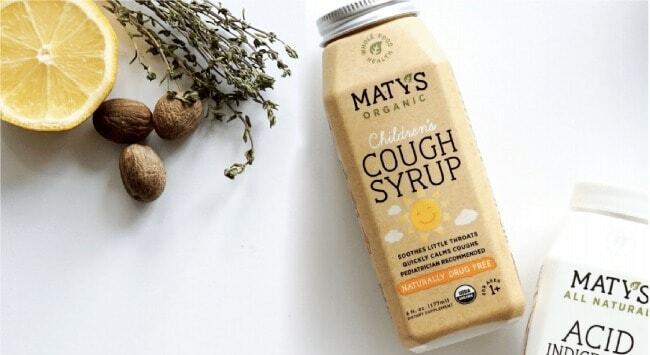 I love the story behind how Maty’s was started: When traditional medicine didn’t work for her baby girl, Maty’s mom turned to the inherent wisdom of another – Mother Nature- to create pure, whole food-based formulas. Recipes, from simpler times that are even more effective today. 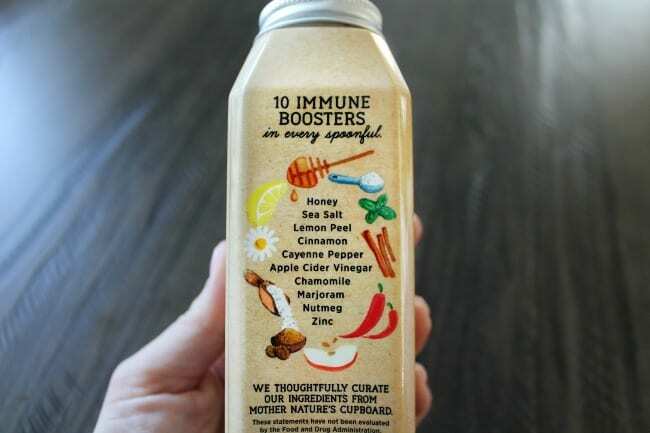 It is filled with immune boosters and natural, whole-food ingredients to help our children feel better & catch some ZZZ’s. It’s just a combination of foods combined into this (cute) container so we can use it and not have an ounce of question on if it’s OK to use or not. It’s naturally drug-free. – Use a diffuser with Lavender essential oils. – A gentle massage before bed. – Dim the nightlight. We found that our kids have all woken up much more when they have a bright nightlight, so once they are asleep, we go in and dim the nightlight (it has two settings). – Have your child wear socks to bed. This can help our children (and us!) sleep better. 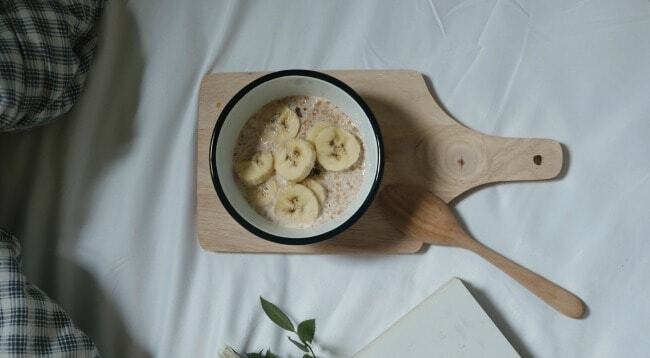 – Drink a glass of warm milk and eat a banana before bed (or have banana oatmeal). Bananas have an increased amount of tryptophan, which can make us sleepy. A study published in the Journal of Clinical Sleep Medicine found that 71 percent of melatonin samples were more than 10 percent of the stated dose, with some lots containing nearly five times the listed dose. In 2001, researchers at MIT concluded that the correct dosage for melatonin falls between .3 and 1 mg. Yet, stacks of sleep aids have as much as 10 times that amount (check them out the next time you are in the pharmacy aisle). Since melatonin is a hormone, it only works if your body does not produce enough of the hormone and may even suppress your body’s natural production of this hormone. Supplementing a hormone is not recommended for children since it could affect puberty, disrupt menstrual cycles, which is the case with melatonin, and impede normal hormone development. Plus, it has reported side effects like headaches, nausea, next-day grogginess, hormone fluctuations, vivid dreams, and nightmares. I’m sure that would make it easy just to increase the dosage and take too much. I’ve never found any evidence of it being even remotely life-threatening, but it can upset the body’s natural processes & rhythms. Plus, the FDA doesn’t require supplements to include warnings of overdose risks on their labels, as is mandatory for drugs and hormones. All in all, I just wanted to put this out there, as it has been on my mind a lot lately. 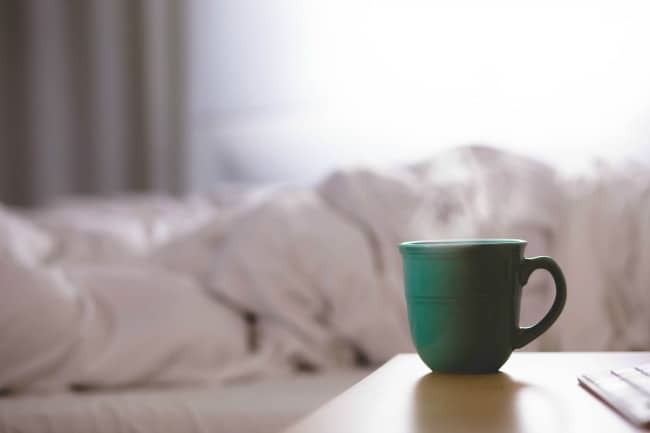 My suggestion, if your child is waking multiple times a night or seems grumpy from lack-of-sleep, is to start with teas, a great bedtime routine and natural, whole-food alternatives. If you find that your child is constantly waking at night or acting tired and grumpy, I’d suggest talking to your doctor. I’m so grateful that we had the sleep study done for our son. It scares me to think about what could have happened if we had masked the problem.